• PHOTO, PHOTO ON THE WALL...INTO WHOSE HANDS DID YOU FALL? • WOW! A TRUE TREASURE! • WHERE IS THE RED TOP? • SO HOW DID AN OHIO GIRL END-UP MAKING TEXAS HER HOME? • TO WHOM DOES BABY KITTY REALLY BELONG? Based on 340 days per year, how many hours has Tish practiced in her lifetime? The winner must be the closest without going over. The winner may choose and receive a batch of homemade cookies from Tish's original recipes. Tish was very entertained while reading the guesses as to how many hours she had practiced. Some were so very low (two hundred) and others were a million or more. Many did the math on the entry form. The closest guess was 57,120 hours. Not bad...but still about 8,000 hours short. Below is a table of the estimated practice hours for Tish throughout her life. PHOTO, PHOTO ON THE WALL...INTO WHOSE HANDS DID YOU FALL? Tish once had a one month engagement at the Walthall Hotel in Jackson, Mississippi. 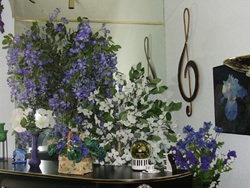 Within two days of her performances, the following picture was stolen from the lobby marquis. The hotel manager inquired about another photograph but Tish did not have one. The pictures were in the possession of her manager. For the remainder of her stay at the Walthall, the announcement of her appearance held a blank space that was once occupied by the picture. WHERE IS THE RED TOP? That was a frequently asked question during Tish's ten month stint at the Holidome at 95th Street and I-35 in Lenexa, Kansas. 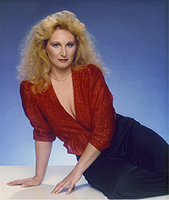 Tish never wore the red top as shown in the stolen promotional picture and there had many requests to see her in that top. Tish argued that the top was false advertising...that it was an illusion ...it was the pose and the way the photographer told her to place her arms that made her look voluptuous. Some of the regulars begged her to wear the top and she agreed to do it. The next day she arrived in the red top as promised but had inserted a matching red yoke making the top quite modest. To say the least, the guys around the piano bar were very disappointed. "Come on boys, you really didn't think that I would wear it as seen, did you?" Tish heard this many times...Where is your low-cut dress? Tish retorted, "When you have talent, you don't need a low-cut dress"? The audience broke-out into loud applause. SO HOW DID AN OHIO GIRL END-UP MAKING TEXAS HER HOME? In June of 1987 Tish was booked for one month in Calgary, Canada and a second month in Banff Springs, Canada. When she arrived at the United States/Canada border she was not allowed to cross into Canada because someone in the border office had misplaced her work permits which are required to be in their possession for ten days prior for entry into Canada. So confused by the situation and misunderstanding how to turn around to go back home, she accidently crossed the border which had the immediate consequences of being stopped by the Canadian border patrol. She was then instructed on the proper route for her return to the United States. Once she had her wits about her... she telephoned her agent who instructed her to sit-tight at the border and he would get it straightened-out before the government offices closed at four o'clock that afternoon. Oh how Tish wishes she had taken photos of this! No offense intended to the folks at Sweetgrass, Montana. As far as Tish could tell, she was sitting in the middle of Sweetgrass, Montana which had a field in the northwest corner, a picnic table and trash barrel in the southwest corner and n the southeast corner there was a grocery and a gas station with one gas pump. On the northeast corner there was a long building with two businesses...a mom and pop diner on one side and a pizza/beer parlor on the other side. Tish spent the entire afternoon sitting in either the diner or the pizza parlor feeling just a little blue. It's a good thing that Tish doesn't drink! To be honest, she really didn't want to go to Canada. It was June and it was forty degrees Fahrenheit and very windy. Tish doesn't like cold! At five o'clock that afternoon she called her agent once again. He assured her that even though it had not been settled that day, he would get her permits and get her into Canada in time to start her gig on the next day. Tish had to drive thirty miles south to find the nearest motel. The next morning she called her agent again and he told to go back to the border...that she would soon be passing over it into Canada. When she arrived at the border office she was informed that they still had no work permits for her and she was once againg denied entry into Canada. Well, at least that time she knew the way back to Sweetgrass, Montana. No Canadians chasing her that time! Tish sat in the little diner and had breakfast. All day long she watched the locals come and go. At the close of the day nothing had been settled. So Tish called an agent in Dallas, Texas with whom she had been in touch. After filling him in on the situation, she inquired about the length of time it would take for him to find her a gig in Dallas. He estimated two weeks. That was good enough for Tish! After arranging a place to stay with a friend, she began the twenty-two hour trip to Dallas. One week after her arrival in Dallas, the local agent had found her a gig at Swan Court in Richardson playing the Happy Hour. Tish was home! She loved the Dallas area and she stayed! The Holidome was the temporary home for people who would come into town for company training. The various company employees would stay at the hotel for two or more weeks at a time and would spend their evenings with Tish seated around the piano bar. An entertainer is like a bartender or hair stylist. She hears it all and discusses it all. One evening with a group of men, the topic of pink shirts arose. Tish expressed how attractive she thinks a man looks in a pink shirt...that it makes him look so soft and alluring. The next night the entire group of men was wearing a pink shirt. What a hoot! They informed her of how difficult it was to find that many pink shirts. As revealed in Tish's biography, she makes most of her costumes. One evening a man walked sat-down at the piano, laid two fifty-dollar bills on the piano and declared, "I want that dress for my girl!" Tish told him to come back the next night. She would get it dry-cleaned for him. He responded, "I can't. I am leaving early in the morning and I need it now. It's winter...you have a coat don't you? You could wear that the remainder of the evening." Well yes, Tish did have a beautiful full-length faux fur coat but she had just started performing ten minutes ago. She wasn't keen on the idea. Suddenly a lady at the piano bar decided to be Tish's representative, "How about one hundred and fifty dollars?" The man was agreeable but Tish wasn't. The lady then spouted, "Two hundred dollars!" The man once again accepted the proposal. Tish shook her head, "No, perhaps if you give me three hundred dollars, I will consider it." The man with a very disappointed look lamented, "Oh I wish I could!" One time Tish's agent sent her to Pleasantville, Iowa. It turned out to be most unpleasant because her agent had sent her to perform for one month in a club that wanted a country musician. Needless to say, after one week she was let go. 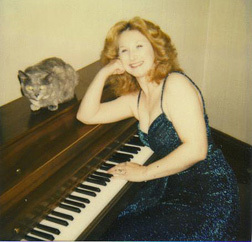 When Tish first moved to Dallas she did house-call piano lessons. She drove around the Dallas area in her little red Chevrolet Sprint to her clients' homes. One of her students was a six-year old daughter of a surgeon who lived in a big beautiful house. One evening after the lesson, the little girl followed Tish outside as she was leaving. This endearing child exclaimed, "I love your car! All we have is a Lincoln, a Lexus, and a Mercedes!" This is just a taste of student stories. Tish plans to one day publish a book revealing all her memorable moments with students. ...was the mystery question at the 2008 Spring Show. Description: Tish's six feet tall Christmas tree is fully assembled, fully decorated and stored somewhere in her house. Hint: It is not in the attic or the garage. Where is it? The prize was the winners choice of two dozen cookies from Tish's collection of original recipes. Although the students and parents were facing the tree all year-round, they did not see it and nobody won the cookies. It is covered with a white vinyl table cloth and camouflaged very well. Can you see it in this photo? TO WHOM DOES BABY KITTY REALLY BELONG? One day Tish's daughter brought Baby Kitty home in her pocket. As Baby Kitty grew into an adult cat, all of Tish's students became quite fond of him. When Tish's daughter decided that it was time to find her own place to live, the students were quite saddened over the thought of never seeing Baby Kitty again. 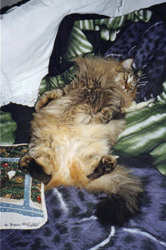 One student suggested that Tish put together a petition to keep Baby Kitty at her house. Tish liked the idea and drew-up the paperwork. All of the students signed it and when Tish's daughter read it, she felt bad about taking Baby Kitty away. Thus, Tish became the rightful owner of Baby Kitty.